Knowing full well there is a world outside of San Francisco, I decided to put up some of the recent shots from around the world that have been posted on our Flickr group. We get some fantastic pictures from all over the globe. 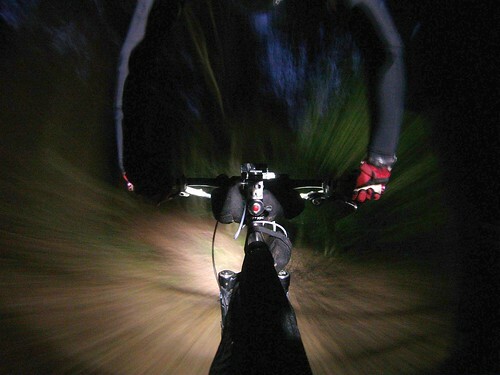 Every kind of bicycle imaginable, ridden in every conceivable way. Visual proof that there is no one way to ride a bike other than just getting on one and going! a new chapter of my alma mater's alumni group has sprung up. the school was the big reason i was in for nyc for 8 years before heading on out here to the wild west. when i heard about the new group, i jumped at the opportunity to join since i truly loved my college experience. anyway, this is all going in that my two loves, bikes and barnard, are going to intersect. i'm hosting a bike ride y'all. it's gonna be short and sweet and involve coffee and beer. yum. 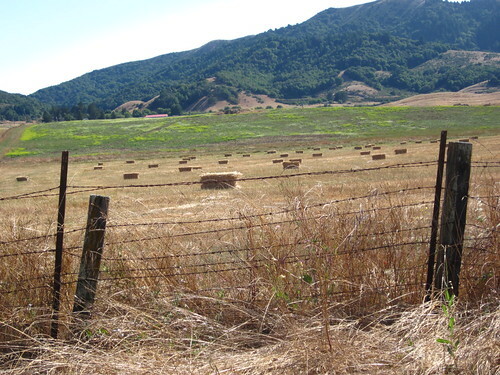 did you go to barnard and live in the bay area? if so, please join us! facebook event here. don't do the FB? well, there's eventbrite tickets available too. see you and your guests on the ride! Excuse me. Can I have five minutes of your time? Could you watch this video? The Ginger Ninjas have done something truly amazing here. It is the kind of thing the rest of us dream about and never do. Let's help them finish this film so we can all live vicariously through their incredible adventure. I know I want to see what happened along the way- the road from Todos Santos to Guadalajara is something I have only experienced on a bus, and that was something else! Visit the Ginger Ninja's Kickstarter page. Give them a couple of bucks instead of buying a latte today. 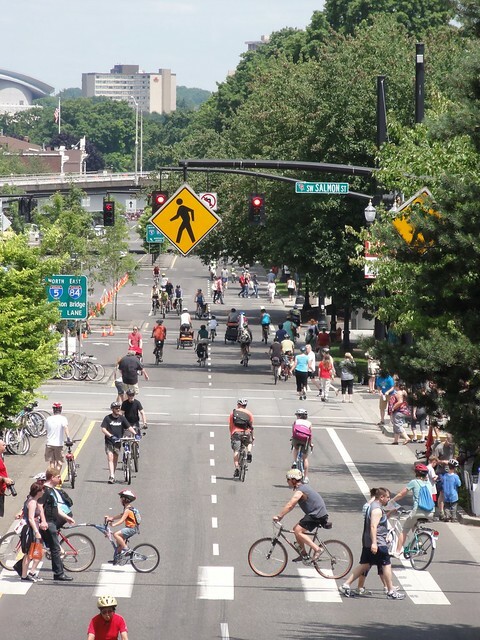 Bicycle community isn't just in the lane! "Change Your Life. Ride A Bike!" 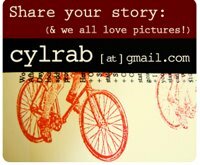 was started on a whim back in 2009 when Meligrosa and I decided we wanted to start telling people's stories about bicycle life. We didn't have a grand agenda, there was no huge plan. We just wanted to share the joy we saw around us all the time and find out where it was happening in other parts of the world. and there we had it. Our line up of women from different worlds, different generations, different geography, different education.... we could not believe how lucky we were to be able to represent that. So here we are in 2011. We have been through the mill this year, and several pounds of flesh have been demanded. There have been times when I think all of us have thought about just throwing in the towel. Somehow, we are still here. Somehow, all of you keep showing up to read what we have to say or to see what we have to show. I think I can speak for all of us when I say we are humbled by your continued support. Your comments and stories make all of this worth it. I bring this up today because CYLRAB has received a little recognition lately. 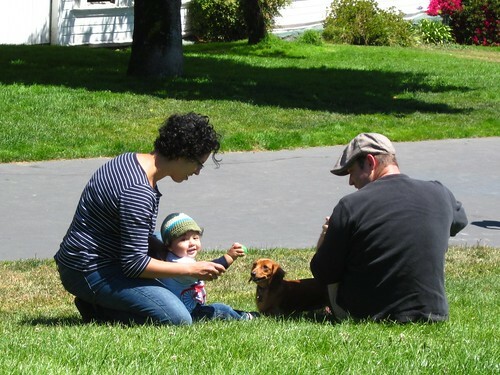 We were recently added to the Top 25 Family Bike Blogs at Circle of Moms and the Top 50 Most Influential Bike Blogs at Extanz.com. This could never have happened without all of you reading and visiting us and we thank you from the bottom of our hearts. This is from back in 2009. I was asked to name 3 of my favorite posts and this one came to mind first. 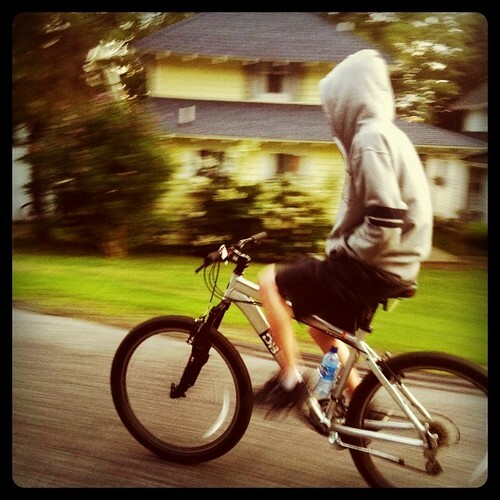 Declan does not sit on the back of my bicycle anymore, and I have to admit I miss having him back there. We had many wonderful, silly and very bonding conversations with one another while he was back there. It is fantastic to see him riding his own like a pro but I will always think of my Bat as a bicycle built for two. Bikes and the environment go together. 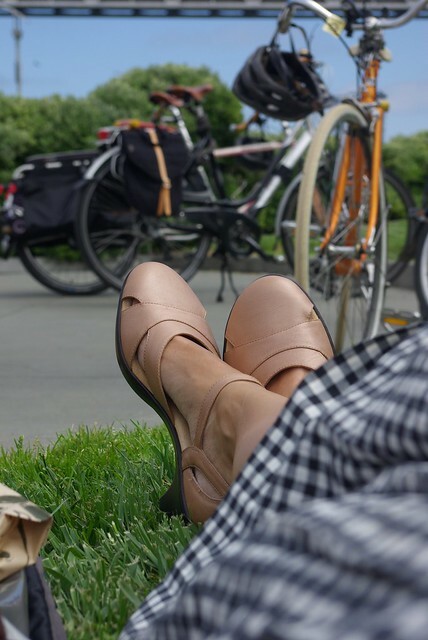 A lovely side effect of riding those bicycles we love! In that spirit, Public Bicycles and the Sierra Club have joined forces to give away three Public bicycles to three lucky people out there in the world. 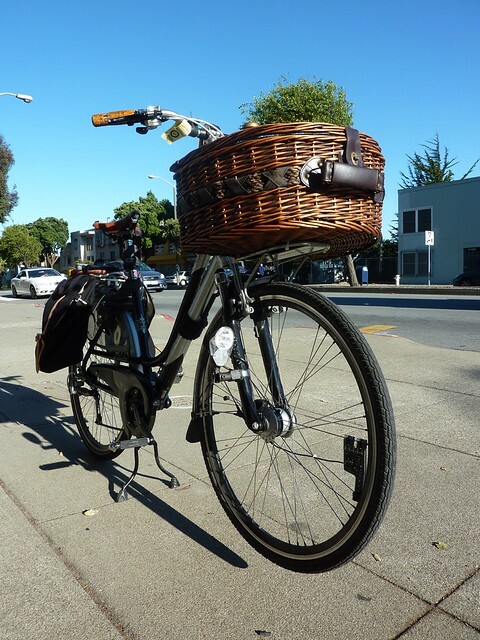 So, if you would like a chance to win a bicycle, and to learn more about the Sierra Club and its good work in the world, enter here and cross your fingers! If you win, please, send us a picture of you and your new bike! 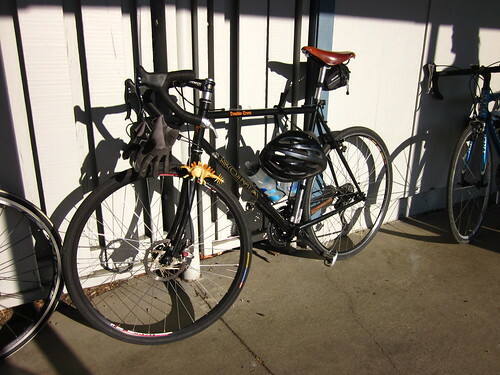 Everyone here at the blog likes to see pictures of our bikey matchmaking. 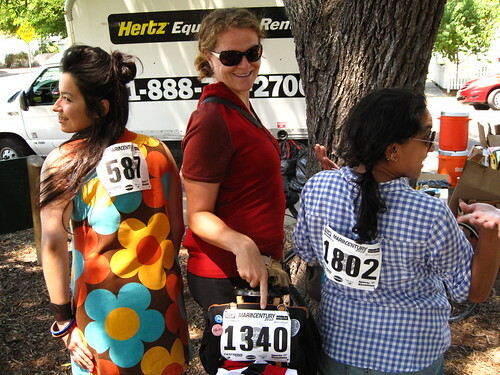 We hear that we make pretty good bicycle Rent-A-Yentas! While several of us here at the blog know a few people at Public, we have no official affiliation with either Public Bike or the Sierra Club. We just pass on the opportunities as they fall in our laps, where appropriate, and most especially when one of our readers could win an orange mixte. Addendum-I know it is Hurricane Irene, but I like the song. For a great while now, I have wanted a handwoven bicycle basket from David Hembrow. You may know him from his blog, A View From The Cycle Path. I have had my Batavus for three years now, and it has taken quite awhile to get it exactly where I like it. 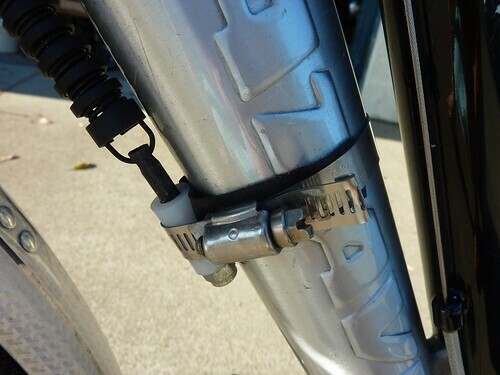 Instead of jumping into buying things that look like they will be great, but end up not being used, I have purchased or made most of the things on my bicycle only after really thinking about it or experimenting with cheep alternates to see what is truly useful. For the last year and a half I had repurposed the removable Wald basket from my old bike by zip tying it to the front rack. This bike was nothing but old stuff thrown together! The rack its self was the cheapest I could find, $18, because I was not sure I would I like having a front rack on the bike. Now that it has been on for so long, I can't imagine the Bat without it. So when the one that is there now becomes too disreputable for my taste I will find a much better one knowing that it will be something well purchased. Back to the basket. Having someone make a basket, and then ship it across the world is not something to take lightly. What if it just isn't right? My Wald basket was great because it was impervious to weather, was really cheap ($18, just like the rack) and when empty didn't cause much wind drag or collect water in the rain. The problem for me was it wasn't meeting my aesthetic requirements. Every time I looked at it, it just wasn't hitting my eye the right way. 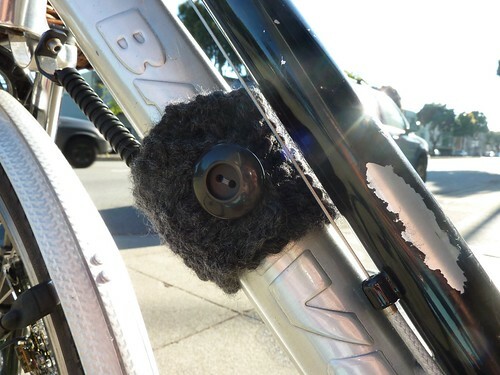 Some may find this a silly reason to replace something that works, but my front basket is something that is always in my line of sight when I ride, so if it is ugly it will always rankle. With that in mind, I had started thinking about David's beautiful baskets again. Not only are they aesthetically pleasing, they are works of art that I can buy directly from the artist (I am a total sucker for that kind if thing). But again, what if I didn't like having it on the front of the bicycle? Zip ties will tie down just about anything! A solution presented its self to me last week in the form of a giant picnic basket being sold at a sidewalk sale. With negotiating it came out to $7 and that meant I had the correct basket for my experiment. Will having a larger basket, with greater wind resistance on a crappy fork mounted rack work for me? So far, it has been a mixed bag. Even unloaded I notice a change in the front end handling, especially in the wind which blows hard constantly these days. It isn't horrible, but I am not sure how much I like it. This basket is also not going to work in the rain as it is lined and kinda cheap, so I will not get an idea of winter riding with it (David's baskets are good even in the snow). On the other hand, it has a great lid which keeps things in and the sun out and it looks great. For now, the jury is out on what my final decision will be. I really love how terribly traditional the Bat looks with the basket on, I may just end up with a Peterboro one, but the call of David's baskets is still quite strong. One thing is sure, taking time to make these decisions pays off. My bicycle is exactly right for me and riding it is always a pleasure. OK. So my DIY from yesterday has been one-upped. OK. 20,000 upped! As a woman who has spent a decade and a half with walkers and the elderly all I can say is that this guy is killing it! I also have to give huge props to his family for not getting in his way. Thanks to Ramona Wheelright for dropping this in our laps! Once a life has been changed by cycling, the notion of not riding becomes a threat to all that is good and true. As demonstrated here by Super Grandpa, of San Francisco, no expense will be spared to accommodate the aging cyclist in her/his quest to be mobile. 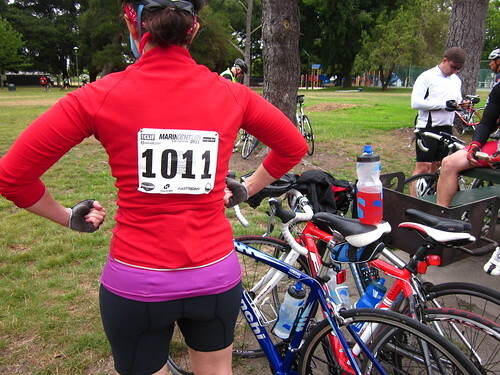 Do you know someone who exudes this sentiment and clearly will always ride? Do you know this man, whose image was captured on Dolores Street? I'd love to learn more about him and how he fashioned his bike support system, as I figure I will be doing the same in a few decades. 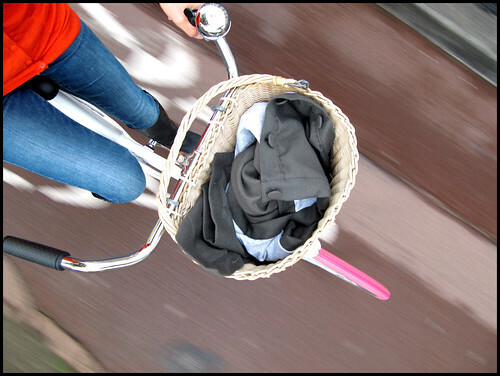 ** This article is cross posted at Vélo Vogue. In the Netherlands? Really? 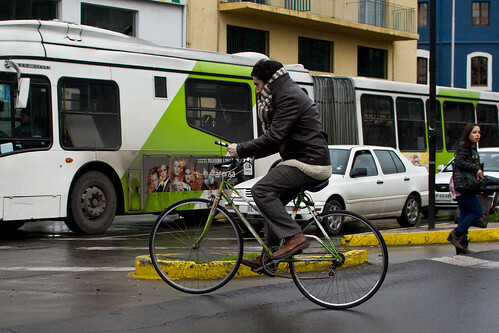 The land of the Ultimate Modern Bicycle Culture? Just goes to show, no matter where you are, you gotta work to have a bicycle friendly society. The snippets you hear as you whiz by are always amusing. "Don't tell me what to do, devil woman!" "So next thing he tells me he has scabies"
"Don't get in a cab if you think you are going to pee in it. Take the bus." I started writing this terribly long post awhile ago. I have decided to leave it as is, unedited and rambling. Read it and continue the conversation in the comments, should you chose to accept the challenge. I am sure that you all have more to say that makes sense than I do! I think it is time that we all started talking about "bicycle culture". It is a term that gets thrown around a lot, but I am not sure that anyone could actually define what it is if asked. Can you? I can't. There is a lot out there about adding to bicycle culture and creating bicycle culture and defending bicycle culture. There are whole blogs about it : ) but what do we mean when we say these things? So today I thought about it. Having lived in San Francisco for the vast majority of my life I have been able to see what bicycling in the City has been like for the last few decades. When I was a kid in the 70's and early 80's it was just what everyone did in my little beach community. We all got around by bike or train or Mustang GT. We didn't think about it, we just did it. The bicycles were just part of the landscape, and unless they were 10 speed road bikes (which were sooooo cool) they were just bikes. We parked them outside of the corner store to get a soda, we rode them to the other end of the beach so our parents wouldn't see us smoking, we took them to the park to play ball. We only thought about them when they were stolen. Our parents used them as a means of not having to pick us up from anything. By the time the mid-80's came around, something started to change. It became strange to ride a bicycle for any other purpose than competitive racing or to storm the dirt trails of any planted area you could find. This was the beginning of bicyclists as a fringe element. Whereas just 5 years before when you got on your old Schwinn to go to the library, now there was neon, lycra clothing and knobby tires and flat handle bars and a horror of anything practical like fenders or baskets or kickstands. We started wearing helmets that looked like toddler training potties. Of course, if all the riding we did was jumping over logs, then this wasn't so strange, but there was still that trip to the Park & Rec that needed to happen to take a cooking class. The only way to do it by bicycle had become a lycra, chamois, helmet experience and if we tried to do otherwise we were ridiculed and driven off the road. This was the beginning of "bicycle culture". When we allowed ourselves to be easily pegged, and thus, marginalized by donning more gear than the guys on the Tour de France did just so we could ride along the beach in the summer. Those who rode a bicycle became a deliberately visible group, defined by the activity of riding and the accouterments that we put with it. We came to a collective agreement that unless you walked away from your bicycle dirty and exhausted that you were not a legitimate bicycle rider. We read magazines with articles about maximizing pedal stroke and how to shave grams and most of all, we became afraid of our bicycles. By the early 90's we were all convinced that our bicycles would kill us if given half a chance. 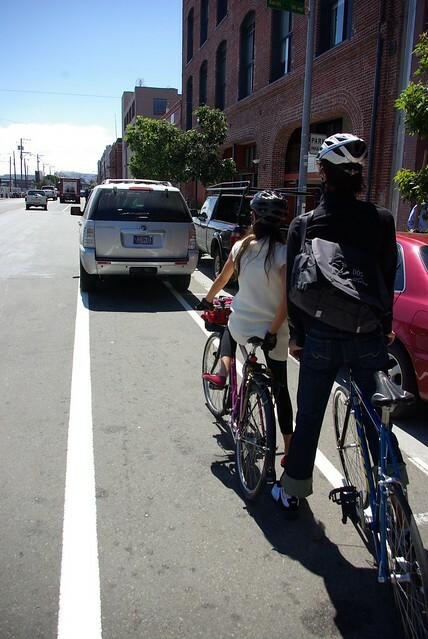 If we rode on a city street, we would be immediately struck down by a car. If we rode on the sidewalk we would get hit by a car pulling out of a driveway. It was indisputable. If we rode on a trail we would get thrown by every pothole or stick in the forest. If we did not wear a helmet, Satan would find us and it would be our own fault that we were dead. In response we became one of three types of riders- non-riders who looked at their bicycles in the garage and thought "I would ride it to the beach but...", weekend sport riders who drove their bikes to points of embarkation away from the crazy streets of death, or urban street warriors who would "live free or die". That was the next step of "bicycle culture". Those who didn't disappear became almost superhuman in the eyes of the non-cycling world (whether that was super-humanly stupid or super-humanly strong was up to the changing interpretation of society at the time). The 90's were also the beginning of what we see in San Francisco, today. 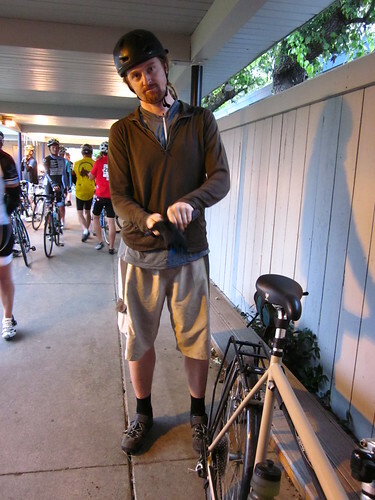 The 90's were the time of the bicycle messenger and the beginning of Critical Mass. 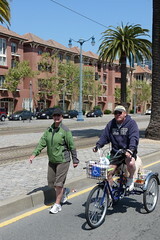 While both were, and continue to be, somewhat controversial, they were nonetheless, the only non-sports related bicyclists any of us saw in San Francisco for a whole lotta years. They were almost all male, almost all young, almost all completely broke, and many of them were drawn to the drama of the daily fight for survival in streets that no longer welcomed any thing with less than 4 wheels and 150 horsepower. They looked nothing like the Bicycle Girls of Copenhagen. Hell, they didn't look like the Office Girls of the Financial District (remember the big hair and the skirt suits?). They were brash, confrontational, brave and fast and the people of San Francisco could only ever see them through the haze of bicycle fear that had engulfed the nation. Still, what is our current "culture"? I am not sure there is an answer to this question. There are so many different kinds of people riding and so many different kinds of groups that they could fit into that I do not think that there is a way to define it simply. Nor do I think it would be good to be able to do so. Back when just about every cyclist on the street was a kamikaze messenger we could define the culture very easily, and subsequently, very few people wanted to join in. Without firm definitions anyone can find a place. fresh off the tribute to val, here's where we get to pass along the love of bikes to the newest generation. 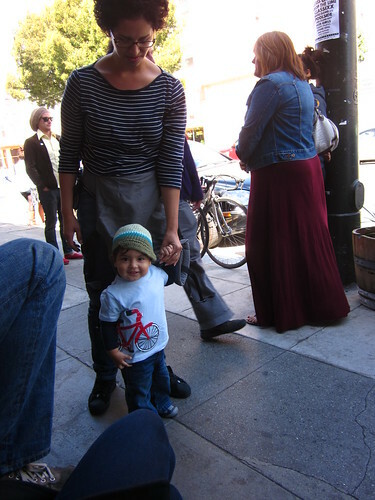 the last time we talked of this little one, he was in his mama's belly, shopping for bikey onesies in the mission. now? he's got his first birthday behind him and more than a couple of teeth in those gums. they are sold out of the shirt, fyi....at least it appears so by going to their site. he can barely walk, but he can stand really well! 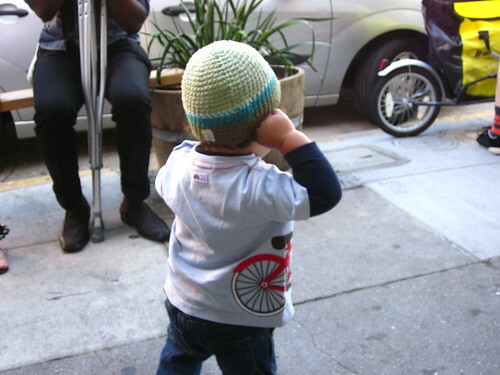 mama here is wanting to take him around their neighborhood in LA on a bike. maybe next time he's on the blog, he'll be on a skuuuuuuuuuuuut it up! 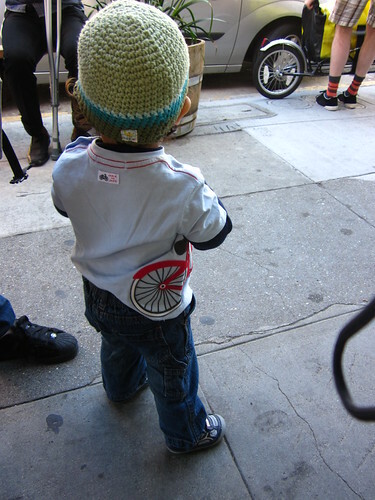 ;) well, maybe first he'll be on the back of a bike. he's certainly dressed for it. other than bikes, looks like we have something in common. 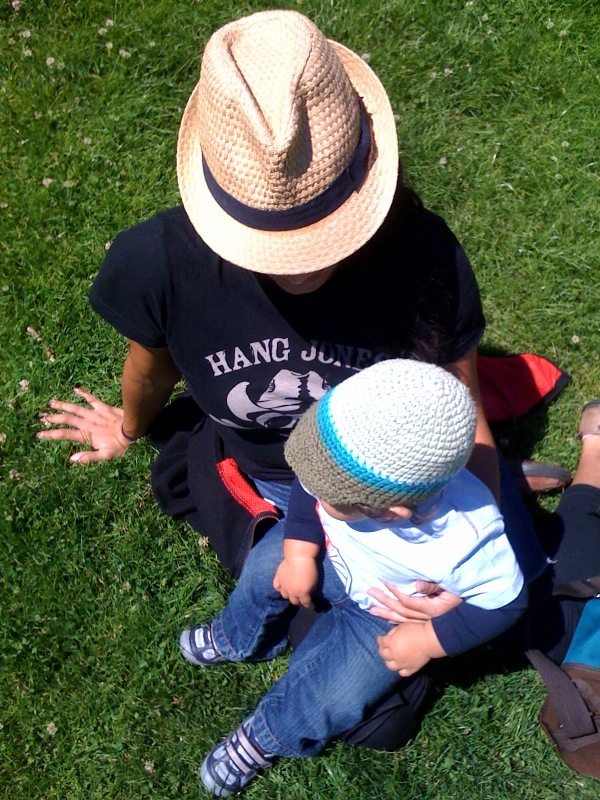 a love of hats. It is with great sadness that I opened our email today. 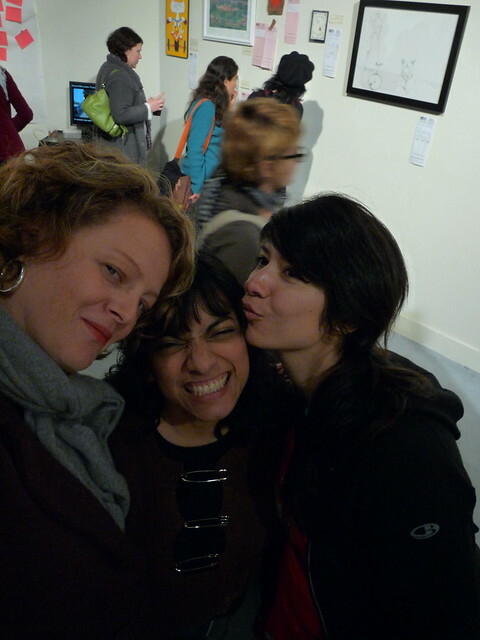 Long time friend to the blog, Val Kleitz has passed away from cancer. Val was a never ending source of stories and photos of his unique, and wonderful view of bicycle life in Seattle. 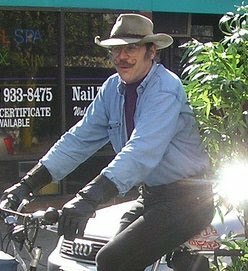 His hat and handlebar mustache always made me smile, even if I only got a chance to see them on my computer. 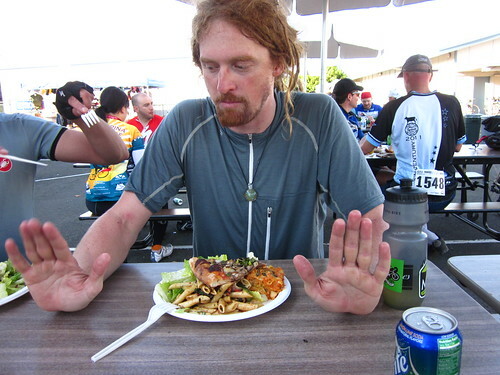 The Labor Day Cargo Bike ride in Seattle will be dedicated to his memory. 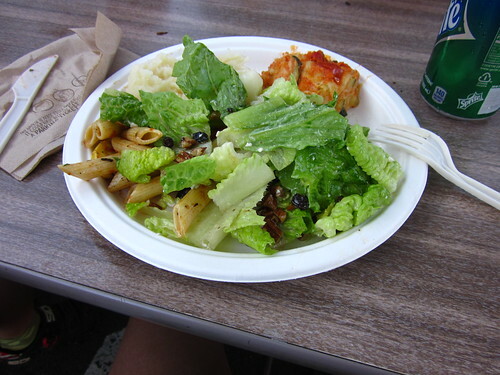 The below picture and email were sent to us by Val in May , 2010. It is the picture I always had in my head whenever I saw a new comment from Val on a post. Good journeys, friend. You will be missed. Today, as I was walking through the local grocery store, I had to pause for a moment to give a couple of very young girls a chance to consolidate themselves to one side of the aisle. They looked to be 3 and 4 years old, out shopping with their dad. 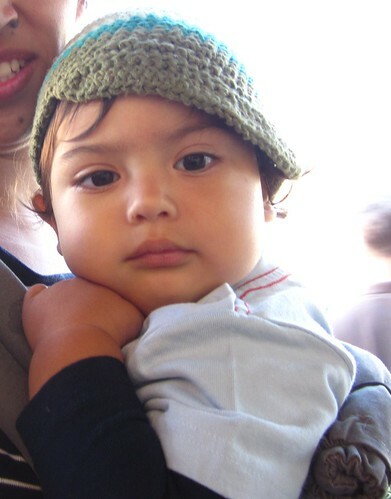 The older one (who had the task of carrying the basket) looked up at me as I passed and said "Cow..boy". I get this a lot from the small ones, and I always just walk away proud, thinking "Yep, well spotted, kid". This time, as I walked away, I heard the dad telling her "No, no - that's that dude on the bike, you remember, you've seen him...". Now I'm thinking "Oh HELL yes!" 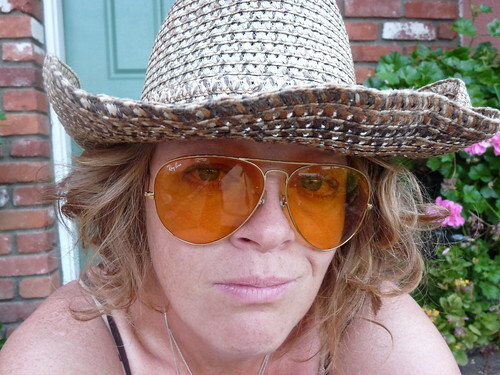 Say what you like, but I seriously believe that the cowboy hat makes me much more visible, and therefore keeps me safer, than any bike helmet. friday fun times: foggy summatime! welcome to summer in SF! 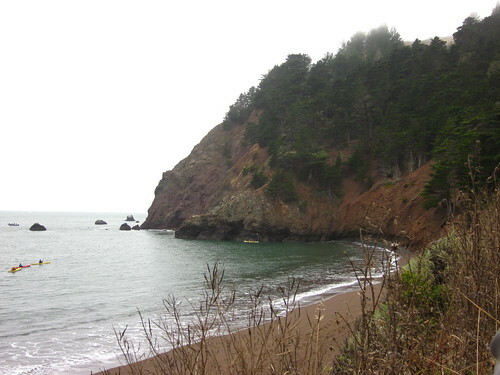 where it's not sunny, but foggy, cool and windy with grey pea soup hanging low in the sky. this is a little video i took the morning after the century ride. i woke up on the opposite side of the bridge. so while this may look like it's taken from chrissy fields (to some), it isn't. this place is also easily accessible by bike from the city. don't have reservations? go anyway during the day! 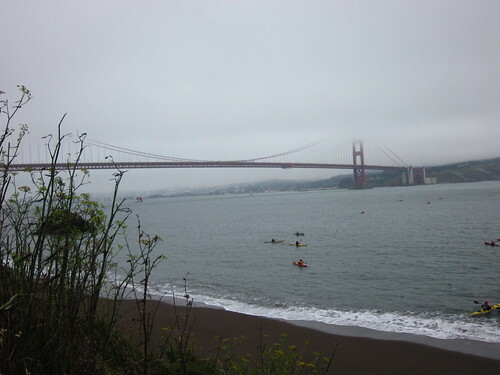 enjoy your hot weather and if you want to cool off after a bike ride, come and join us here in sun-deprived sf! Again with the silly Cycle Chic kerfuffle? It seems "Cycle Chic" is now a patented concept. It seems others continue to have trouble with the concept. I have talked about it many times before, so there is little for me to say about it at this point. This would just about cover it. 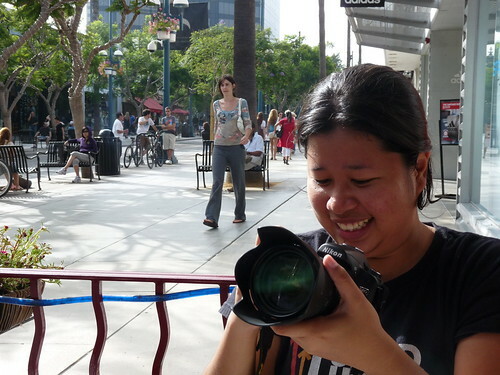 A couple of years back, I was visiting my Mother in suburban Los Angeles. 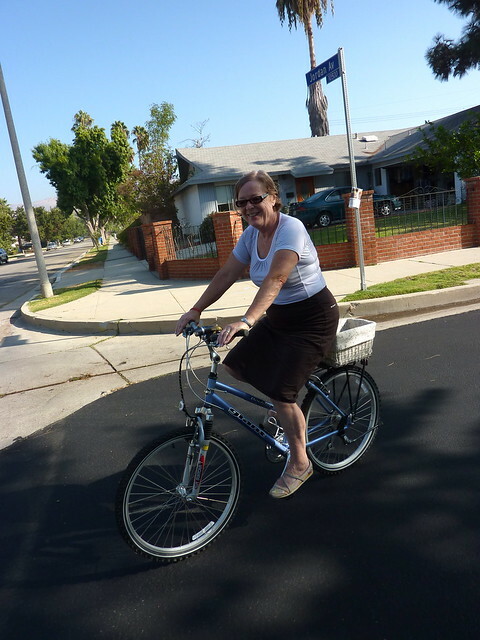 As per usual, I took my bicycle with me so I could use it to ride around the neighborhood and across the Valley when we were not out as a big family. When I am down there, I usually ride to the cafe near her house in the mornings to grab a cuppa and to get a few minutes of bicycle peace before the family circus kicks in. 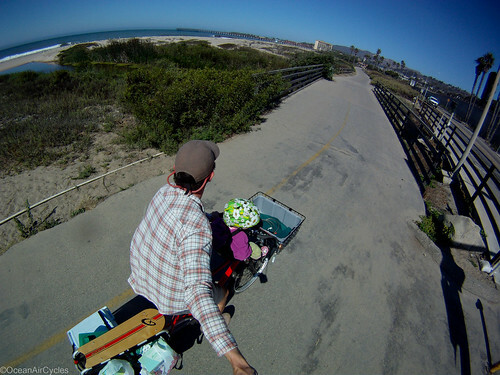 Until this morning, my Mom had always viewed my bicycle advocacy and blogging as one of "those things" that I "do". That morning, my mom beat me to the punch and asked if I would like to ride with her to the cafe. She was going to put on a skirt and I was to take a picture of her for my blog. And "not that Change your life one. The other one, Vélo Vogue". 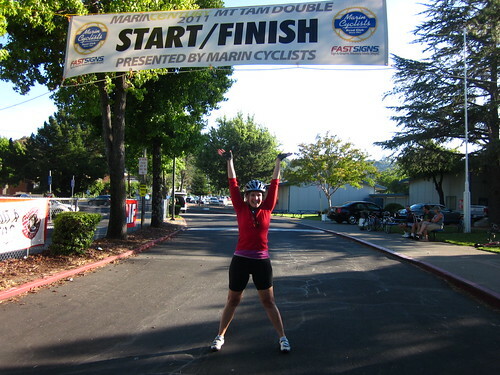 My Mom, a seasoned, successful medical professional who manages a multi-million dollar hospital department, who will knit the world back together after the Tea Party gets through with it, who grows her own food and learned how to drive a race car had no interest in letting anyone know about how her bicycle has effected her life. She wanted to be cute and to be seen being cute on her bicycle. My 63 year old mother didn't feel like she didn't fit a mold that was being imposed on her by someone else. 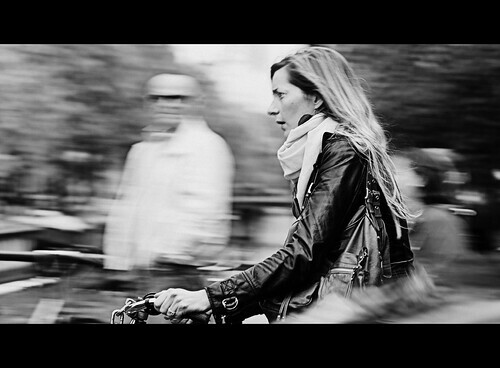 She could see the message for what it is- take joy being yourself while riding a bicycle. 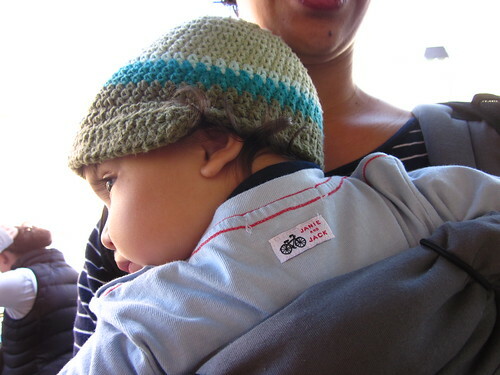 So, for those who see no value in "cycle chic" I say this, if my Mom likes it, then it is OK by me. this weekend while ade was encouraging you to get off the interwebs and on the bike, i was already a few hours into my 2nd century, the first one to be 100 miles. 100 kilometers no more. here are some pictures. a moment of peace. and cows. and signs. don't mess with this meal! and then i woke up to this. it was pretty amazing. calmed the screaming thighs down. 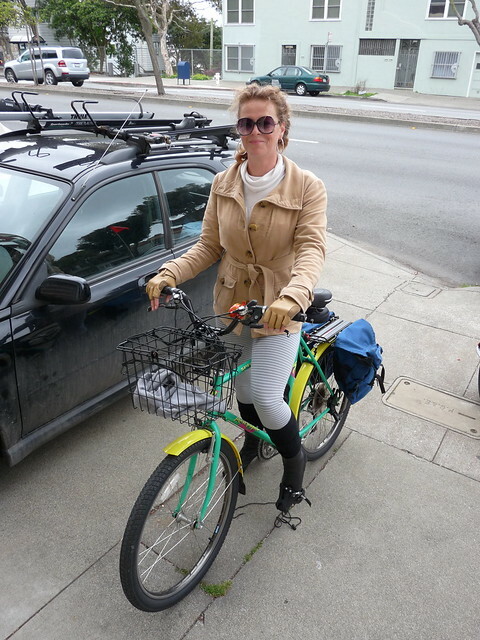 it was good to run into so many people from butterlap, and from the sf bikey community in general. we are awesome! i look forward to doing more rides and becoming a stronger rider as a result. i've come a long way in a year, but there's so much more to do and so much farther to go. that means more time in the saddle, and that is never a bad thing. much love to all of you. happy tuesday. Stop looking at the internet and get out there! Your bicycle wants to go see something! It was brought to my attention yesterday, that should I follow certain links, I may find myself in odd places. Spots usually reserved for those traveling to and from Brooklyn and riding the Tour de France. If you look carefully, you will also find another CYLRAB face in there. Should I be nonplussed? addendum- I don't do nonplussed too well. I'll just go with my smartass look. More people will recognize me like that. Yeah, Baby! Run 'Em Over! Maybe you have seen the Mayor of Vilnius (Lithuania) running over a car parked in the bike lane already. Maybe this is all over the internet. I don't care! I would vote for him if I could. As I have stated before, San Francisco has more of an extended cell phone parking lot than it does an extensive bicycle network. So, Mr. Mayor, if you would like to run to be the next Mayor of San Francisco I will be your campaign manager for free! "i'm not nervous, i'm not nervous" is the mantra i keep telling myself. but yes, i am. 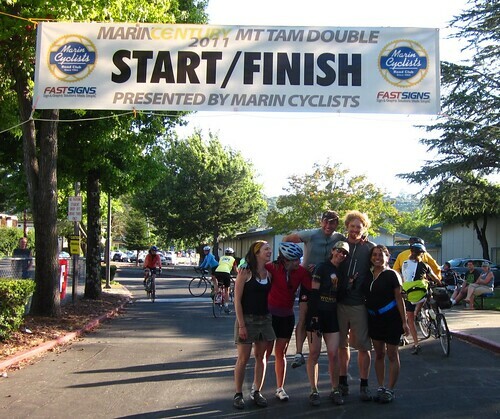 i'm doing the marin century for the 2nd year in a row, but instead of doing 100k, i'm doing 106 miles. i'm not getting any younger, ya heard? last year my "training" regimen consisted of going up to twin peaks a few times, some rides in marin, and lots of butterlap. 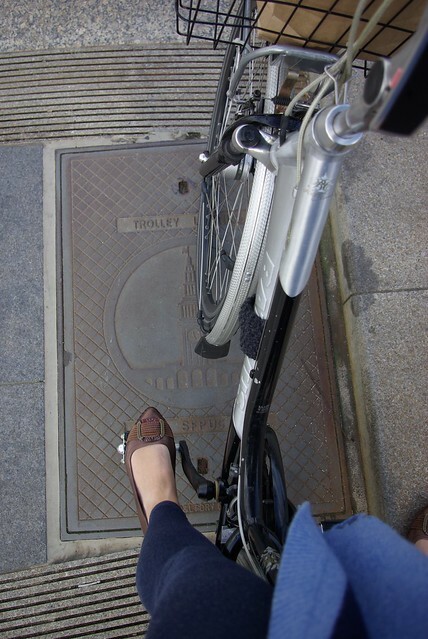 after riding in 5 year old pumas with toe cages and while nearly at the top of my monster hill, i conceded defeat. only to see the top of the hill when i pulled over. ugh. i felt so OFF that whole day, and riding in the heat was something i was not entirely used to. this year i have some new fears, some new shoes/pedals, and some new riding partners. i've been going on longer rides more frequently, starting with a small tour to SC, eventually going up and over 6k + hills, including the seven sisters (whoa, that was fun! the crappy roads into mill valley, not so much...). am also trying out different eating styles, different bars or should i have trail mix? what sort of energy drink should i get, if at all. my legs hurt, i should get a massage. do i like heavily padded shorts, or just liners? (btw, so far the liners seem to agree w/ me the most...). and don't forget the skorts! i never thought my foray into biking for transportation would lead me here, but it has. and i love the challenge of it! i'm embarking on something i never would have thought a year ago i would do, much less five years ago. overcoming obstacles and challenges makes you stronger. amirite? i'm not nervous. i'm not nervous. ok, maybe i am, but i'm enjoying every second of it, except maybe the clammy palms. saturday!! please come now!